Are You Financially “Tapped Out” But Still Suffering, Worn Out From Listening To “Experts”, Or Feeling Frustrated by Lack of Results? If so, KEEP READING because this might be exactly what you’ve been looking for! …to help them solve their problems in life. They believe (consciously or unconsciously) that they can’t do it themselves and they need help. I’m here to tell you THAT’S NOT TRUE – at least not in the way you’ve been taught to believe you need help! I created a solution that’s GUARANTEED to assist YOU in getting the results you seek. 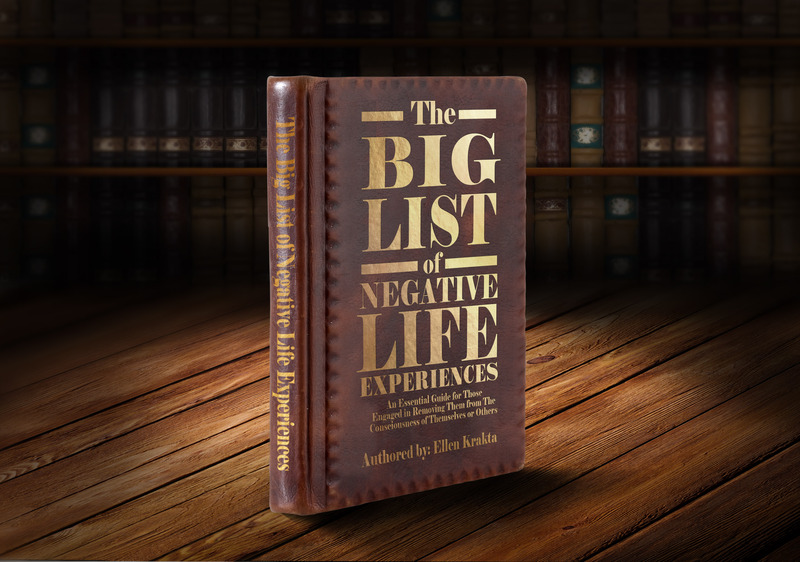 It’s an ebook* called The BIG LIST of Negative Life Experiences! Click here to order this ebook today! * An ebook is a book that is delivered to you digitally without a hard copy. You can order it from anywhere in the world and have it delivered immediately to your computer. This book is a veritable treasure chest of things you will discover about yourself. It contains the true sources, causes and reasons for your problems AND is the key to finally getting rid of them for good. “My first project using the ebook was to work on inferiority. This led me down a garden path of feelings and memories from this and other lifetimes. I saw and released the thinking I had drowned in a lifetime, I had watched it and taken it on. Using the charts in the book I went through many layers and versions to delete this belief, including having attached to a mass consciousness around inferiority in order to use it as a safety net. Once I worked through this side I had to take a look at superiority, which was equally interesting! “I like how the charts flow. I will practice with this book a lot more. My intention in the last few weeks has been to feel strong to being seen and to nurture myself, and this ebook provides me with the ideal steps to take along that path. I love how Ellen’s energy, which comes through in the book, feels gentle and safe. For me it makes it easy to use and spend time with. “Before I got the book I had been strengthening weaknesses around the words serve, servitude, slave etc. I continued to have some issues around control in my life in connection with these. 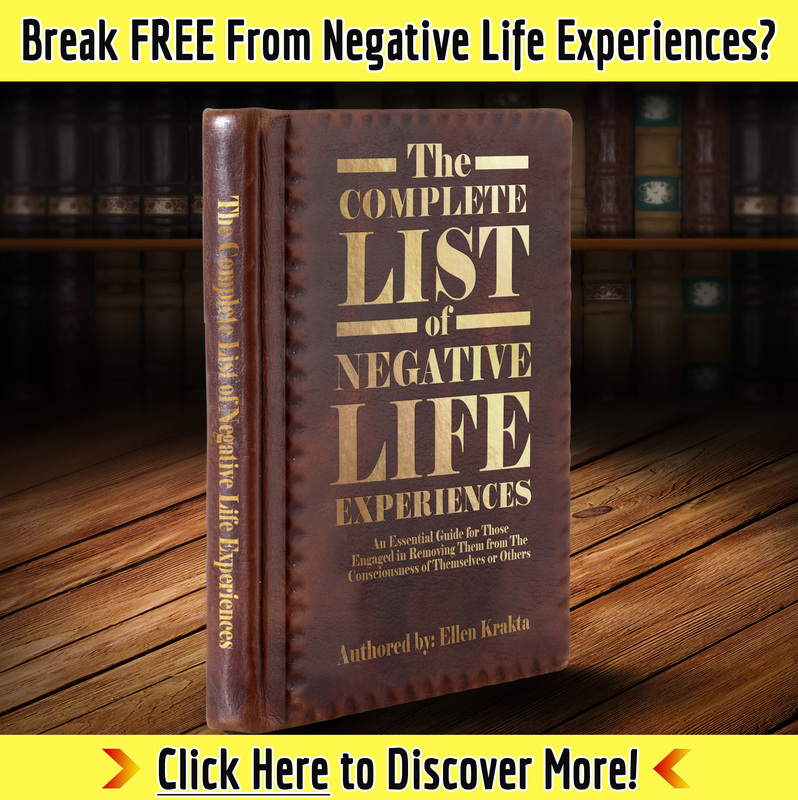 When I used Ellen’s Big List of Negative Life Experiences ebook I was not surprised when I was first led to the word Agency (in charge of my life) but one of the items in the list of ways the experiences may have occurred, “You had someone traumatize or limit another for you,” did surprise me. As you can tell from the testimonials, this is a very practical book. There is no reading and learning in the way you may be accustomed to doing those things. There is, instead, exactly what you need to create immediate change as you go through the material. The people you see in the pictures above could do this because they knew how to use their physical intelligence to feel what is true for them. But no worries if you don’t know how to do that now. By purchasing this ebook you will be TAUGHT HOW as part of your purchase (see 3. and 4. below). …and you want to possess enough skill and knowledge to do it without having to rely on “experts”. This book is your “cheat sheet”! It doesn’t matter if you are highly skilled in the work of consciousness transformation or energy psychology, or a total newbie. Will lead you to the answers and solutions you seek. You can click here to order today. …it will be especially valuable to those who thought they had found the sources, causes or reasons for their problems but still haven’t experienced them going away. If you feel stuck in any way, you’ll love this book. It can also be the answer for those who have already spent a great deal of money on practitioners and experts who promised relief but didn’t deliver. If you are financially “tapped out” but still suffering, worn out from searching, or frustrated by lack of results, this book is for you. And begin living a more fulfilling and rewarding life! What you’re purchasing is a two-part system for solving problems, consisting of an exhaustive ebook and a bonus training class.. The ebook is as close as anyone has yet come to a complete listing of the sources, causes and reasons for all your problems. …is that the ONLY thing required in order to then delete the problems is full acknowledgment of (all) those sources, causes and reasons. Teaches you how to find the elements of the list that apply to you and your specific problems, and how to work through a problem until its complete resolution. …designed to respond to insight (feeling combined with intuition and clear perception) and acknowledgment. No matter what they are! …limitless improvements in all areas of your life. Click here to order the ebook today and get the bouns call with it as well! …in the form of improvements you will notice immediately and the confidence to make continual progress in all areas of your life. I will also provide you with whatever personal support you need for the first 30 days (and as long as you remain a part of the community described below). This support includes assisting you to identify and delete (at least) 3 things in the ebook that are your personal weaknesses. Your purchase gives you access to an exclusive community. And I’ll demonstrate the value of that in the first group call, which you receive at no extra charge when you purchase the book. That’s right… The first month of community membership and the initial training call is your FREE BONUS for ordering this ebook today. And, if you like what you hear and the changes you experience on that call, then you can simply stay part of this growing community with us for only $37/mo. after that! When you purchase you are being automatically enrolled in this support community, which offers you monthly live calls and more. Your improvements – and your confidence in applying the material in the ebook to your life – will continue to grow for as long as you remain a member. Of course, you can cancel any time and not be billed again. This community and the support calls – especially the first one in which I teach you how to USE the material you’re receiving – is how I GUARANTEE you’ll continue to experience noticeable results from this ebook month after month. No one is left on their own, and I will personally make sure you see improvements with this book. So they go away and YOU FEEL BETTER! …to show you how to use this ebook to DELETE your problems and experience more joy, inner peace and personal freedom!